Enrico is a smoky buckskin White Sands mustang who came in during a 2016 South Dakota humane case (from the International Society for the Protection of Mustangs and Burros. You can find more details about this case HERE). He was a stud at intake but is now gelded. Enrico was foaled in approximately 2014 and currently stands 14hh. 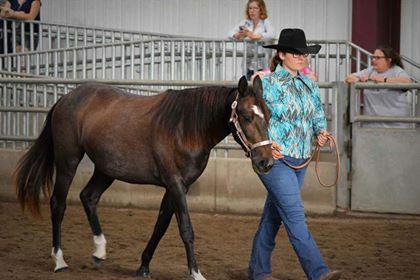 He was relatively unhandled at intake but spent the summer of 2017 in training with DaeLyn Bucher to compete in our 2017 Promise of the Future training competition on September 16th. Enrico and DaeLyn took home the Grand Championship form the Promise of the Future competition! You can see Enrico and DaeLyn’s journey Here! Enrico is a potential candidate for our 2018 Trainer’s Challenge of the Unwanted Horse.